It's that time of the week again, The Friday Review! The weekend is glittering like a gorgeous big glass of Veuve Clicquot (mmmm) and it's time to kick back, relax and talk products. So before you find yourself staring at the skincare counters looking bemused have a little read of this weeks review. The lovely folk at Soap and Glory sent me 'Feel Good Factor' to try and I have to say, I was excited. I use an awful lot of Soap and Glory products, usually at least one every day so I'm always interested to see what they're bringing out. As I have no doubt mentioned (ad nauseum) I use a combination of products before I put on my make up. I just can't bear putting foundation onto unprepped skin so I tend to split my foundation, half and half with moisturiser, primers or moisturising bases under my foundation. Mostly I use Bright Here Bright Now by Soap and Glory which there is a review for here. Since my Bright Here Bright Now ran out and I haven't gotten round to replacing it, I've been using a combination of Catch A Wrinkle in Time and Wonderfill, (the latter is a superb primer, not what it's designed for but it was a gift which I 'forgot ' to give). So when Feel Good Factor arrived I had something new to put under my foundation. Hurrah! 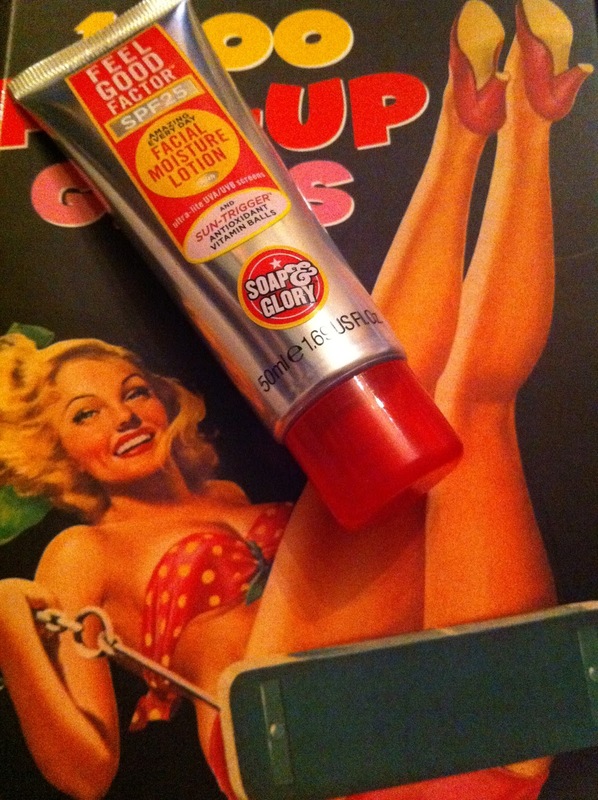 So what do the boffins at Soap and Glory say about it? INTRODUCING our NEW Daytime Moisture Protection Fluid SPF25. A silky smooth age defense system which helps to smooth & protect the skin against wrinkles, pigmentation and dryness. With our exclusive *SUNTRIGGER™ technology & ANTI-AGING SMART SPHERES built in. Sounds pretty fancy doesn't it? I still have no idea what 'anti-aging smart spheres' are but goodness me I feel much better knowing they're there.So lets boil it down, what exactly is it? It's a moisturiser which is filled with vitamins C and E and antioxidants, it also has lots of anti-aging properties with both UVA and UVB protection and is SFP 25. As those of you skin protectors out there know, you need both to be fully protected. As the sun is the major cause of skin damage and the dreaded wrinkles it is very comforting to know that you'll be keeping that youthful complexion with a splodge of this! I'm naturally very pale, I am Irish after all. I don't tan particularly well, and I don't really sunbathe either. So I was immediately interested in the product. I fear wrinkles, I really do. If there is anything I can do to stop myself getting wrinkled then I'll happily put it on with gay abandon. I love the sensation of feeling protected from rays which might damage my skin and make me look old before my time so I was really excited about this. Sun protection in moisturisers and make up isn't a new thing but what Soap and Glory have done here is to provide a much higher SPF than the other leading beauty brands. Certainly price wise for the savvy girl shopper nothing on the market matches it. Estée Lauder's range of protection skincare only protects to SPF 15, as does L'Occitane's and Elizabeth Arden's. Dermalogica and Clarins provide similar SPF protection but for a much higher price. To get such a cost effective moisturiser that is SPF 25 one has to delve into specialised sun protection lotion which has different characteristics. One of which being the waterproof nature which is perfect in the pool but not good under your make-up for everyday wear. One of the things I liked about the product was how light it was.It is a really thin cream which doesn't leave a dense residue and spreads really easily on the skin leaving a light sheen.No-one wants to feel like they're wearing heavy creams during the day, you often find that the lasting ability of foundation is compromised by an overly dense cream. When I have worn it I haven't even noticed I've got it on, it leaves no white residue or wet feeling on the skin. It absorbs fast and you don't have to wait an age to put your foundation on over the top. I may not have bought it had I just been pondering it at the Soap and Glory counter. 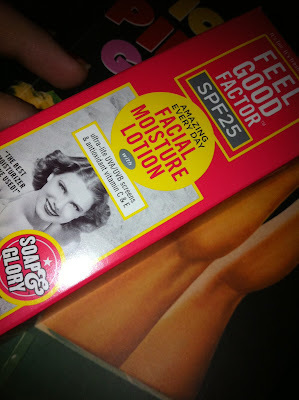 Primarily because I was using other products that I felt fitted into my beauty regime just the way it was. I've always been someone who uses SPF but only when I'm on holidays. It has never really occurred to me to use it day to day in Ireland as we don't get that much sun! But even in winter the Dermal Institute state clearly that you should still be using SPF because UVA rays can penetrate cloud cover. Well that's me sold, with UV rays being responsible for most of the ageing process a good SPF moisturiser has to be one of the best things you can invest in as an anti-ageing tool. I think I'll keep using this, I like the feeling that my skin is protected, its like I've built a little brick wall around my skin to keep harmful rays out and its also moisturising and giving me some nourishing anti-oxidants in the process. This one is a keeper, anti-wrinkle must have.